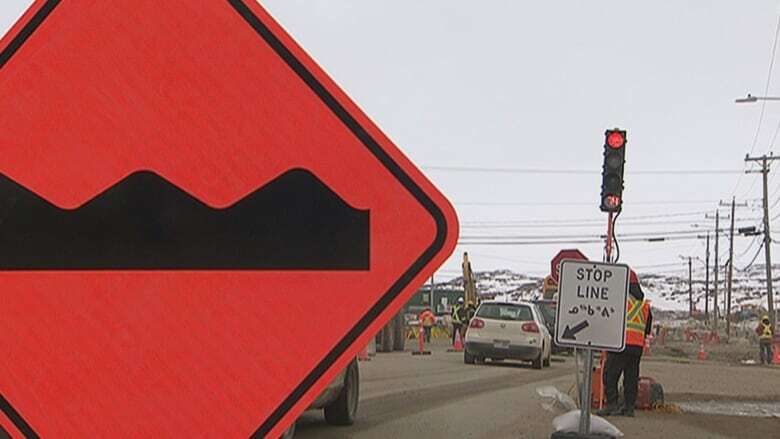 Work has begun on Iqaluit's Federal Road — and with it, a first for Nunavut's capital: traffic lights. The project, which began Monday, involves paving a long stretch of the road, from Qaqqamiut Road to Ikaluktuutiak Drive. This stretch is a busy hub in Iqaluit, serving as an entrance to the city from the airport terminal. Traffic is down to one lane in parts of the road while work is completed. However, it's the lights, which were installed to help with traffic flow during the project, that have locals abuzz on social media. Typically, Iqaluit does not have any traffic lights, making the features a curiosity for residents, rather than the commute-halting nuisance they're often seen as in larger cities. These stoplights are, for now, probably the only ones in all of Nunavut territory. Iqaluit is by far the largest community in the territory, and when I visited them in 2014 there were no stoplights in two of the four next largest (Cambridge Bay and Rankin Inlet -- the others, Arviat and Baker Lake, weren't on my itinerary).